In the main building there is a restaurant accommodating abt. 60 persons as well as a lounge with sofas and TV where you can cosily spend time together. 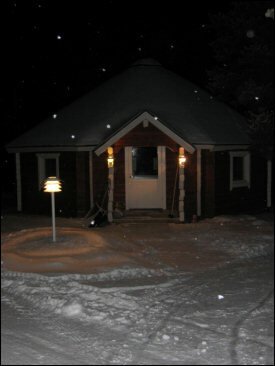 Log hut, octangular, heatable with kitchen facilities and seats for about 60 people. A nice and cosy place for evening entertainment with friends and various festive occasions. 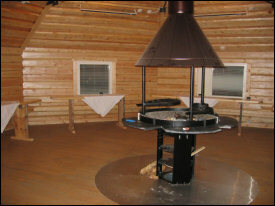 A log hut named "Kunteus", a reindeer in its 4th year, has a fire place and seats for 5-6 people, a cosy place e.g. for a family to spend time together by open fire. "Nimiloppu" is a reindeer older than 6 years and has given its name for the lavvus for smokers. NB! Smoking is forbidden in all rooms and the restaurant.